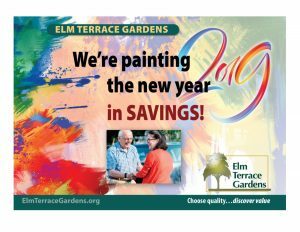 At Elm Terrace Gardens, we make it easy to enjoy a relaxing – yet dynamic – retirement lifestyle. Our services and amenities are designed to make life simple and worry-free. Plus, every resident can receive a free YMCA membership . . . and Elm Terrace Gardens will provide transportation to and from! We invite you to check out our Life Enrichment calendar to see what’s going on at our community.